Monarch's three-day visit is focused on strengthening commercial, political and cultural ties between the two countries. 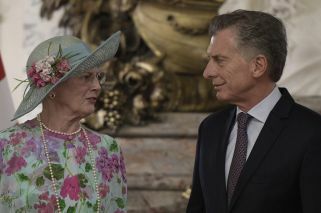 President Mauricio Macri welcomed Queen Margrethe II of Denmark to the country with an official lunch for the royal delegation at Casa Rosada Presidential Palace in Buenos Aires on Monday. The Queen is set to visit both Congress and the Supreme Court today. Queen Margrethe's three-day visit is focused on strengthening commercial, political and cultural ties between the two countries, and exploring potential business partnerships, the Danish Embassy said last week. The Queen is accompanied by Crown Prince Frederik, Foreign Affairs Minister Anders Samuelsen, and Environment and Agriculture Minister Jakob Ellemann-Jensen. A delegation of 30 leading Danish companies – representing sectors like agriculture machinery, water, biogas, and healthcare – also arrived in Buenos Aires for a set of meetings with Argentine businesses Tuesday. The Queen’s itinerary also includes visits to La Bombonera, iconic home of the Boca Juniors football club, the Teatro Colón and the Parque de la Memoria in the capital.